Relocating to a new home is a common step we will all take in our lives. Each of us has to contend with this at some time or another. Some will only do this once or twice in their life, while others do it often. Either way it still is a difficult task that consists of lots of work. You will have to begin by planning the process, such as making schedule to ensure you have enough time and obtaining things you may need such as wrapping, boxes, transportation, parking spaces, additional help and more. Then you have to start sorting all of your goods, wrapping each, and everyone, before placing them into suitable boxes. After this, you have to remove everything from your current home, and that includes your bulky and heavy furniture. Once you’ve managed to get it on to all the vehicles you have to drive it to your new address, unload everything, and unpack it. This can ruin the ruin and excitement of a relocation so if you want things to be simple and fun then get in touch with South Kensington Removals. 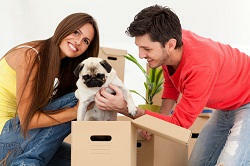 One call to us on 020 8746 9652 can see the work required for your move disappear. A new home can bring many advantages and this is what you should be focusing on. A new abode can allow you to have extra room for family, storage and enable you to add an office, nursery and more. If you lack a garden, attic, basement, garage or another important facility this gives you the chance to add what you need. If you find yourself cut off from your workplace, schools, shops, banks, parks, restaurants, pubs, transport hubs, etc, then relocating to a better spot can put you closer to what you need. Conversely, you may want to be further away from all of this and enjoy serene surroundings. A new home gives you the chance to redecorate and it can allow you to experience new things, meet new people and reinvigorate your life. If you want all this then we can put you on the path when you call. Our operators can answer each and every question you have, as well as fill you in on everything you need to know, including our various services. The more we know about your move, the better we can tailor the experience to you needs and our free quotes that require zero commitment, will guarantee you get the best deal. Our skilled team can offer every service you could ever need for your relocation, starting with packing. They will use the best materials and techniques that will keep your goods safe and easy to transport. They will then turn their attention to your furniture and you’ll be glad to have us here, because removing large items (and later placing them into your home) can be difficult and hazardous but all you have to do is sit back as our team expertly navigates them out of the building. We have many vehicles at your disposal and we can use them to take your goods to wherever you plan on living, whether it’s down the road or across the sea. Storage is an important and often overlooked aspect of a move but we have facilities that you can use for as long as you like. If you want the most streamlined assistance then make sure you inquire about our Man and Van service. Relocating doesn’t have to be difficult, and all you need to do to keep it this way is get in touch with South Kensington Removals now.